We have not programmed any activity for this Friday evening to allow you to discover what Madrid night-life is all about at your own pace. 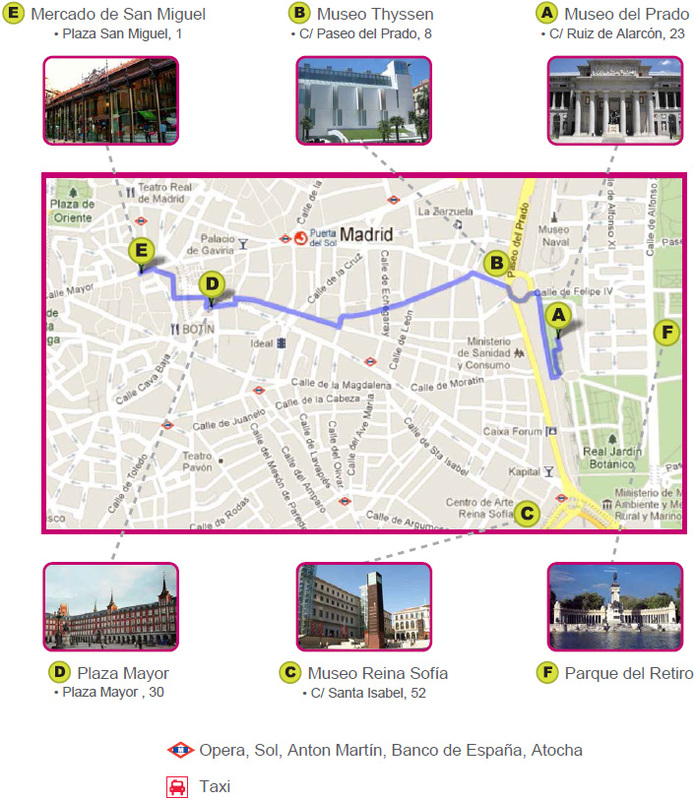 Take advantage of this opportunity and visit some of the best museums in the world: the Prado (www.museodelprado.es), the Reina Sofia (www.museoreinasofia.es), and the Thyssen (www.museothyssen.org) museums, all located along the Paseo del Prado. For further information, please refer to the “Visitor tips” section in this programme book or at the Colloquium’s webpage. For about 15 you can buy an "Abono Paseo del Arte", a special voucher that allows you to visit each one of these top class art museums once during your stay. From 18:00 to 20:00 the entrance to the Prado Museum is 5 . In some special cases, the entrance is free. Look for the Spanish paintings of Velazquez, Goya, Murillo,… they’re exceptional! The museum closes at 20:00h. The entrance to the Reina Sofia Museum is 7 if you go before 19:00h. From 19:00 h until closing (20:45h) the entrance is free. Without a doubt, the crown jewel of this museum is Pablo Picasso´s “Gernica”. The Thyssen Museum is also very interesting, but it closes at 19:00h. After satisfying your artistic appetite, you can taste the very diverse and delicious Madrid cuisine. You can easily find a wide selection of excellent restaurants that serve food from all over Spain as well as from different countries. If you want to try something typical, have some tapas: with a group of friends, hop from bar to bar and try one or several varied and savory small dishes. Enrich the taste with a good Spanish wine or beer. The most typical area to have tapas is located near the Plaza Mayor (which is worth the visit in itself. You can walk there from the Paseo del Prado). You may also like the Mercado de San Miguel, a great place for an incredible gastronomical experience about 300 m from the Plaza Mayor, or the bars in the streets adjacent to the Plaza (Cava baja, Cava alta, Mayor,..). Click here so see other social events.